Braising as defined by princeton.com means to cook by browning in fat and then simmering in a closed container. 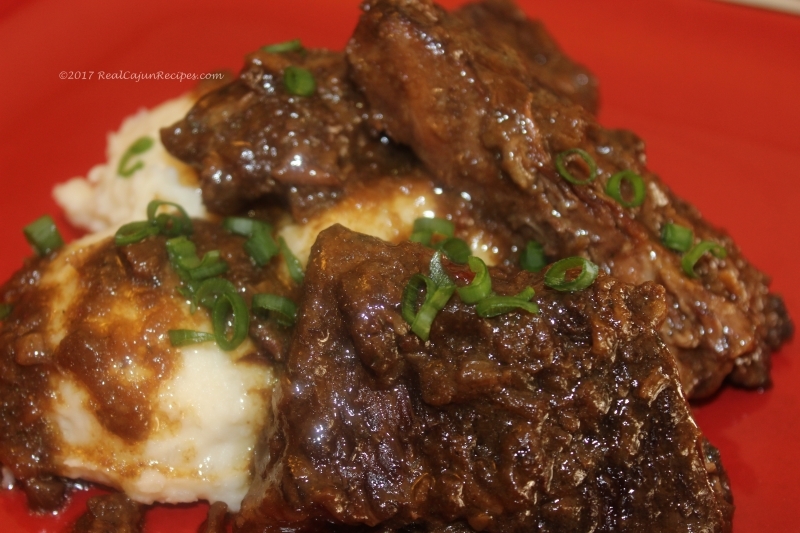 Many Cajun beef and pork dinners and suppers are cooked this way. Rib recipe can be cooked stove top or in the oven. Ribs do not have to be pre-boiled. Salt and pepper the beef ribs. Then roll and coat the beef ribs in flour. Place the oil in a heavy roaster and brown the ribs. Add the onions, water, vinegar and Worcestershire sauce. As an option add 1 chopped bell pepper, 2 stalks chopped celery, red pepper and garlic. There should be enough water to cover the ribs. As the Cajuns would say at this point, "you let the meat cook down"; actually it is the water that will evaporate and the meat cooks in the process. Simmer, covered just at boiling for 2 to 3 hours or until ribs are tender. Watch it and stir and skim off the fat as needed. You may need to add a little water towards the end to prevent sticking or burning. Cover the pot at the beginning of the cooking cycle and then in the last half hour of cooking, remove the lid and get the ribs brown again. Add water as needed. Great Gravy! Method 2 - Baking the ribs - Preheat oven 350 degrees - In a Magnalite roaster brown ribs add onions, water, vinegar and Worcestershire sauce. Cover and bake until tender approximately 1 1/2 to 2 hours until fork tender adding water if needed. As another option, you could add 1 small can tomato paste, 1/2 cup ketchup, 1/2 cup light brown sugar, 1/2 cup white vinegar, and 2 tablespoons yellow mustard.